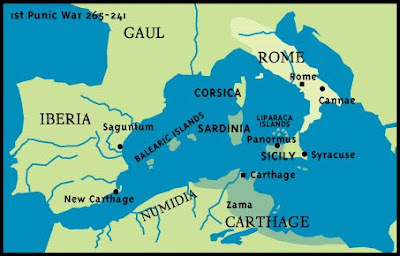 3rd Century The Carthaginian Empire streches across north Africa, the Belearic Islands, Sardinia, Corsica, and most of Scicily. 260 As the Romans were inexperienced at naval warfare, they were defeated in the Lipara Islands. At the Battle of Mylae the Romans gained a victory by outfitting their ships with hinged planks. This allowed them to make use of their excellent infanry in naval engagements. 256 Naval Battle of Cape Economus- Roman force lead by M.Atilius Regulus and L.Manlius defeat Carthaginians lead by Hamilcar Barca. Roman army invades Africa. 255 Battle of Tunes- Romans in Africa defeated. 249 Battle of Drepanum- Carthaginian victory on land and sea. 247-242 Romans continue attacks on Sicily repulsed by Hamilcar. 241 Battle of Aegates Islands- Carthaginian fleet defeated. The peace treaty forces Carthage to give up Sicily and to pay retribution money to Rome. 225-222 The Gauls, having invaded italy as allies of Carthage, are pushed out by the Romans. 219 Hannibal, Hamilcar's son, lays siege to the Spanish city of Saguntum. The city was a greek colony allied to Rome. This sparks the Second Punic War. Legions are sent to deal with Hannibal, but the Carthaginians escape. 218 Hannibal leads an army over the Pyrenees and the Alps into Italy. He brought 34 elephants with him, but only 7 survived the journey through the mountains. November: Battle of Ticinus- Romans lead by consul Scipio defeated. 216 August: The Battle of Cannae- Although being vastly superoior in numbers, the Romans under C. Terentius Varro suffer a terrible defeat. Roman city of Capua defects. Battle of Nola- Hannibal repulsed. 215 Second Battle of Nola. Hannibal is pushed back again. 215-205 Macedonia becomes allied with Carthage. First Macedonian War begins. 212 Hannibal takes Tarentum, the largest port in Italy. 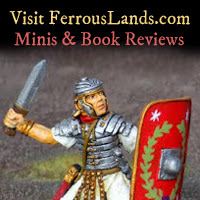 Capua is put under siege by the Romans. At the battles of Capua and Herdonia the Paetorian amries are defeated. 210 Battle of Herdonia- Hannibal destroys two Roman consular armies (roughly 3 legions each) At the Battle of Numistro the Romans are defeated again. 209 In Spain, Scipio Africanus captures new Carthage. Roman forces under M.Claudius Marcellus are defeated by Hannibal. Raerntum is retaken by Rome. 208 Hannibal's younger brother, Hasdrubal Barca is defeated by Scipio at the battle of Baecula. 207Hasdrubal Barca crosses the Alps into Italy. Hannibal marches north to meet him. Before they could join, Hasdrubal's army is stoppped at the Metaurus River and is defeated by the romans under M.Livius Salinator and C.Claudius Nero. Hasdrubal is killed and Hannibal flees south again. 206 Battle of Ilipa- Scipio Africanus defeats the Carthaginians commanded by Mago Barca and Hasdrubal Gisgo in Spain. 204 P.Cornelius Scipio Africanus lands troops in Africa. 203 Battle of the Great Palins- Two Carthaginian armies under Syphax (a Numidian) and Hasdrubal Gisgo are defeated. Hannibal manages to sneak his army out of Italy and arrives to the defend of Carthage. 202 Battle of Zama-After a failed elephant charge, Hannibal's army is completely defeated. Carthage surrenders. Rome requires the Carthaginians to give up Spain, the islands, North Africa, her navy, and her army. 149 Carthage had recovered economically from the penalties placed on her. Jealous of this, the Roman senate decided that Carthage had broken the reaty and the third Punic War was declared. A descendant of Scipio Africanus, Scipio Aemilianus blockades Carthage. 146 The walls of Carthage were breached and the starving defenders lead by M. or C. Vetilius were slaughtered. The city was burned to the ground and its civilians were sold into slavery.